You might be surprised at the large number of celebrities who live with hearing loss on a daily basis. 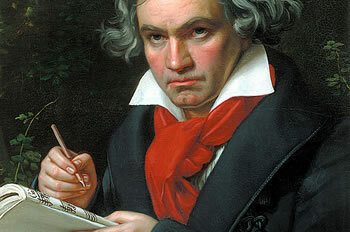 Of course, its perhaps one from another time who is most famously known for his hearing loss, and interestingly, it’s one of the greatest musicians that ever lived: Beethoven. Keep reading as we explore some of the artists today’s young people can better relate to. If it’s the ones from a more modern society you’re hoping you can relate to, here are a few of the most well known singers, celebrities and other artists you’re sure to recognize. Did you know Huey Lewis, the incredible recording artists whose biggest hits came in the 1980s, lives with hearing loss? The “Heart of Rock and Roll” singer became a spokesperson and perhaps one of the most famous personalities for the Oticon Delta hearing aids a few years ago. Pat Benatar, another incredibly talented musician, was a bit more vocal in why so many recording artists suffer with hearing loss, “Unfortunately, many of my peers are in denial”, she said when explaining the damage done to hearing during concerts. She too became a spokesperson for a hearing aid brand, Energizer EZ Change, which specializes in hearing aid battery dispensers. Will.i.am is one of the most talented and recognized musicians in the world today. His incredible talent comes to life as he records with the Black Eyed Peas. He too has hearing problems, but his are different than a hearing loss; in fact, he will never know what silence sounds like. Anyone who suffers with tinnitus knows what that feels like. Will.i.am is one of the most recognizable members of his band, too, especially due to his distinctive haircut and incredible wardrobes. The rapper/producer/recording artist who’s sold tens of millions of records knows full well the symptoms of inner ear damage. Many artists can relate to this as well as it’s often due to exposure to loud noises or prolonged exposure to them. Once damaged, the nerves and other organs in the inner ear are permanently impaired. Tinnitus is an irreversible condition. Those who have it can relate to not knowing what silence feels like. In fact, many who are prone to migraines often say the constant ringing adds to the pain and one young woman, before realizing what she was saying, told her doctor, “The silence kills me”. That was her idea of silence until she realized the constant ringing that had become part of her life was anything but silence. It was the ringing that made her migraines that much more painful. If you hear a constant sound even in silence, you suffer from some level of tinnitus. It can be experienced in various ways, from a humming to buzzing or worse, a constant high-pitched ringing that no one else hears. Will.i.am’s tinnitus developed early in life due to frequent exposure to loud music. After spending several years in the recording industry, he realized the ringing he’d always heard – or at least since his early teen years – wasn’t normal. He now knows the hearing mechanisms in his ears is permanently damaged. And, like others who suffer with this condition, he seems to surround himself with noise at all times so that it’s easier to ignore. Another young woman we spoke with recently can also relate, “I sleep with the TV on. I don’t need the volume up at all; in fact, I usually mute it, but when the TV is off, the ringing in my ear becomes unbearable because it’s too quiet”. That’s why I really regret it…I hurt my ears and they’ll never be the same again. None of us ever met Queen Elizabeth, but the beautiful and gracious royalty was born deaf. You might be surprised to learn that she read lips in several languages. What an amazing self-taught ability she possessed. Her final years were spent on charitable efforts, including founding the Christian Sisterhood of Martha and Mary. This past January, the British Tinnitus Association unveiled the list of artists that had agreed to contribute to a brand new awareness compliation for tinnitus. Both Coldplay and the Black Eyed Peas are amongst the list of artists who have agreed to participate – both of these bands have one or more members who suffer from the hearing condition. Of course, as we mentioned above, Will.i.am is a member of Black Eyed Peas. The album is sure to have not only an effect on the UK, but a global push as well. The album is titled “I Am The One In Ten”. This comes from the fact that one in ten suffer from tinnitus in the UK. After exploring the CMU website, we learned that it’s not only band members who have some form of hearing loss and/or tinnitus, but the crews who travel the world with the artists also deal with these hearing related problems. This promises to be an incredible awareness project designed to encourage research into the condition while also securing much needed funds for the collective hard of hearing community. In fact, evidence in recent years suggests that tinnitus could result in mental disorders due to the ceaseless nature of the affliction, which can be so bad it causes insomnia. There are two camps with this mindset, but for those who live with it know all too well the frustration and feelings of helplessness. Currently, the album is being put together and along with both Coldplay and Black Eyed Peas, artists like Adam F, DJ Fresh and Freakpower are all slated to contribute their music. Several others have signed up, as well. Tinnitus most certainly plays a role in the hard of hearing community. Like those who cannot hear, those with this disorder live with the inability to ever hear silence. The research for the hard of hearing continues and ideally, solutions will be found in the coming years with continued improvements to hearing aids continuing until then. Do you suffer from tinnitus or hearing problems? We’d love to hear from you. Share your story with us either in the comments or visit our Facebook page. As we continue to move forward, it’s the stories of those who live it every day that will ultimately be the driving force. one thing to suffer from disease or a genetic hearing loss, but it’s really bad if your hearing loss results from your own actions (or inaction). As a photographer, I ofter photograph concerts and loud wedding receptions. I almost always wear hearing protection, but I constantly see young people dancing right in front of the speakers without wearing hearing protection. I wish that more people would learn from these “examples” of famous people who suffer from hearing loss and take the initiative to protect their hearing.